Work, it can be a great source of pride and joy when you’re doing what you love, but it can also be a large contributor of anxiety and stress in our lives. Roughly half a million people in the UK suffer with work related stress and every individual affected by work-related stress lost an average of 23.9 working days. 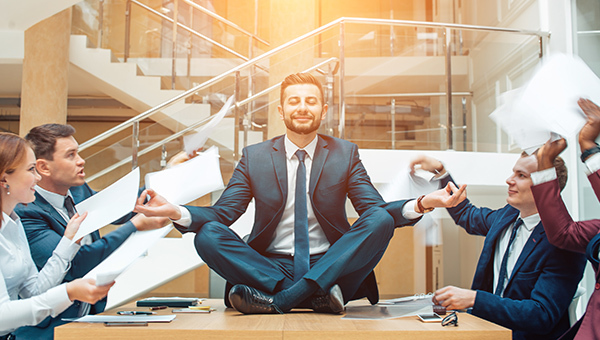 The good news is there are ways to reduce stress and it’s affects so you can stay mentally and physically strong, so, if you’re looking to minimise the effects of stress in the workplace, look no further! Check out these simple, easy to apply ways you can stay healthy and curb the affects of stress in the workplace. The average UK worker only takes 27 minutes of an allotted 40 for lunch, mainly through feeling overwhelmed with work. However, working through lunch actually decreases productivity. Try taking extra time on your lunch break and going for a walk/ stretching. Not only will this release endorphins, the ‘feel good’ chemical, it will also increase your productivity, allowing you to get more done and reducing the stress of mounting, incoming work. Nuts, in particular almonds and peanuts are not only high in antioxidants, they’re also naturally high in magnesium. Magnesium is great for lowering blood pressure, combating some of the effects stress may cause. Try keeping some nuts in your desk drawers and having some with your lunch, not only will they help maintain your body’s natural blood pressure balance, they’ll also keep you fuller for longer. You can get your nut intake in via tasty snack bars or as they come in packs on our website. Good news for some of our readers we’re sure! Eating dark chocolate reduces the levels of the stress hormone (cortisol) and releases endorphins. Dark chocolate also improves blood flow to the brain and improves learning, memory and focus. As if we really needed more of a reason to eat it! You can buy dark chocolate on our site to enjoy it’s amazing flavour and stress relieving benefits from our online store. So there you have our (rather tasty) tips on how to reduce workplace stress and its affects. Whether you work outdoors or in an office, we’re sure there’s a takeaway for you. What tip are you most excited to try? Are there any we’ve missed? Leave a comment and let us know.